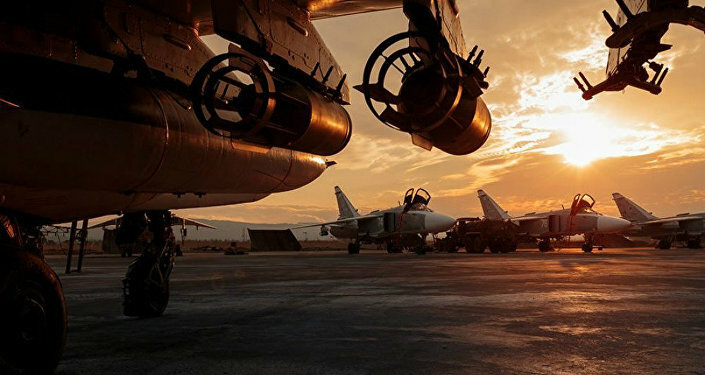 September 30 marked the second anniversary of the beginning of the Russian Aerospace Forces campaign in Syria. Speaking to Sputnik, Iranian political analyst Mohammad Ali Mohtadi stressed the strategic importance of this military operation, which he said added greatly to the weakening of the Daesh terrorist group. He recalled that over the past twelve months, Russia's air counter-terrorism operations have mainly been conducted in western Syria, while in the country's east, including the cities of Deir ez-Zor and Raqqa, there was less activity. "All this led to the fact that currently, Daesh terrorists are living out their last days because the operations carried out by the Russian Aerospace Forces in Syria snuffed them out," Mohammad Ali Mohtadi said. He drew attention to the fact that apart from pinpoint airstrikes on terrorists' positions, Russia also provides "powerful air support to the Syrian government army and its allies during offensive operations." "Therefore, without any doubt, the operations of the Russian Aerospace Forces in Syria are of strategic importance; in particular, they add significantly to the ongoing military operation to liberate Deir ez-Zor," Mohtadi pointed out. He recalled that the United States entered Syria without getting the go-ahead from the Syrian government or the UN. Supporting the Syrian Democratic Forces, US troops moved towards predominantly Kurdish regions, and then to Raqqa. The goal is to "gain control over a special territory — the border between Iraq and Syria," according to Mohtadi. "But it was the success of the anti-Daesh operations conducted by the Russian Aerospace Forces that infuriated Americans, as these operations became a major obstacle to Washington's plans for Syria as a whole. After all, let's not forget that the US military presence in Syria is illegal, something that has repeatedly been declared by Syrian President Bashar Assad and the country's Foreign Minister Walid al-Muallem," Mohtadi said. He added that by contrast, "the presence of the Russian military in Syria is a completely legal action, approved by the legitimate Syrian government." "Accordingly, the Americans have no right and simply must not be present in Syria," he said. Having suffered a fiasco in the so-called "fight" against Daesh in Syria and Iraq, the United States began an active anti-Russian propaganda campaign in the media, trying to publicly discredit the political image of Russia, according to Mohtadi. "The Americans are simply not satisfied with the brilliant victories of the Syrian Army, actively supported by the Russian Aerospace Forces and the Iranian-Lebanese land military unit, including the Islamic Revolutionary Guard Corps and Hezbollah. The Americans do not want Daesh's destruction because it is their creation. So it is safe to say that Americans themselves directly added to fueling the Syrian crisis," Mohtadi said. He added that with the destruction of Daesh inevitable, "Americans would like to use alternative forces under their control." "However, they were prevented from doing so by a powerful bloc of Russia, the Syrian Army, Iran and Hezbollah. It was this bloc that managed to fully change the balance of forces on the Syrian front and add to the development of another scenario for the settlement of the Syrian crisis, which is coming to a close," Mohtadi concluded. Moscow has been conducting an anti-terrorist operation in Syria since September 30, 2015, at its president's request. On March 14, 2016, President Vladimir Putin ordered the Defense Ministry to start withdrawing the Russian air group from Syria. Part of the group is still in place there, continuing to launch airstrikes against terrorists, including those from Daesh and al-Nusra.